Hi everyone... Happy Friday!! 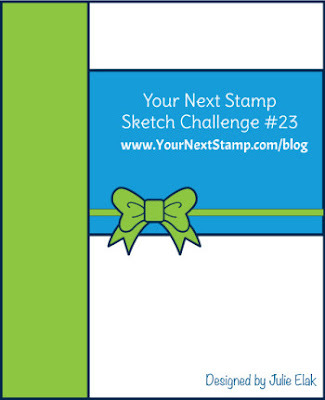 There's still a week left to join in the fun at Your Next Stamp for the Color & Sketch Challenge... 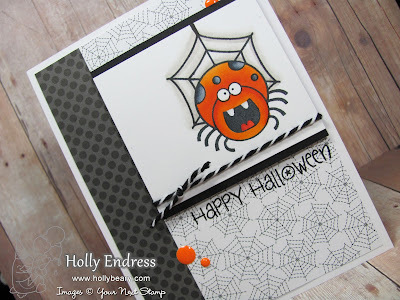 I'm sharing a card I made with the Sketch this week and the fun Halloween set Fang-tastic. You can use the Sketch or the Color Challenge of if you are really inspired use them together! I went with the Sketch and I used some fun pattern papers from the Oct. 31 pack from Doodlebug designs. I stamped the spider from the Fang-tastic set using some Memento Tuxedo Black ink and I colored it in with Copics. then I added some Black & White Baker's Twine and adhered the panel to the card with dimensional adhesive. 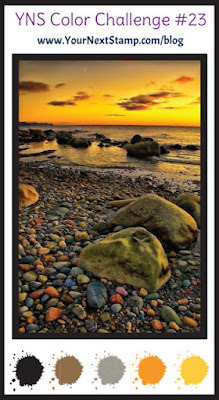 I stamped the sentiment from the same set under the image panel and then I added a few of the new Candy Corn gumdrops.. I really love just the touch of the Orange with the Black and White papers. Be sure to head over to the YNS blog for more inspiration using this week's Challenge.. and we hope you will join in the fun. There's a $15 GC for the YNS store up for grabs! Ha ha! That spider is hilarious! Love it! Great coloring, and awesome card!